In 1998, the Board of Or Shalom struggled with how to reconcile two challenges. The first was to honour those who made special contributions to the shul or the community, and the second was to preserve the ideals of Or Shalom`s egalitarian values within the holy space of the sanctuary. After much study, thoughtful consideration and lively debate, it was decided that Or Shalom would continue its tradition of declining named recognition on the building or its furnishings, but would instead record major contributions in a manner that would preserve the history and significance of the gift and its context. The idea of a Book of the Givers was proposed. The Book was crafted out of oak and brass, and constructed in such a manner that pages could be added over time. Those most familiar with the history surrounding some of Or Shalom`s most precious religious objects were asked to write something of the story so that it could be preserved and remembered by the community. However, the Book of the Givers provides an account of only a small fraction of all of the meaningful donations that have been made to Or Shalom over the years. Although they will not be named here, Or Shalom`s existence is due to the many hundreds of wonderful souls who have volunteered their time, their talents, their money, or their wisdom, and made our community what it is today. In remembering the large or concrete donations, we also reflect on the less visible and often thankless donations that have been made to Or Shalom in such forms as: childcare, davvening, cooking, schlepping, decorating the shul, preparing for ritual, leading meditation, planning retreats, serving on the Board, handling our finances, securing us a physical space, cleaning up after us, visiting the sick, writing melodies, encouraging us to be socially conscious, helping us network with the larger community, tutoring our young people, providing transportation, administering, talking Torah, and simply being counted within our minyan. In a small way, this Book of the Givers is intended to recognize the multitude of mitzvot that have built, and continue to build, this community. When people notice the little Aron Kodesh (Holy Ark) high up on Frank Segal’s Aron Kodesh, behind Avi Dolgin’s Ner Tamid (Eternal Light), they wonder where it came from. Well, it was among my father’s effects when he died. My father was a rabbi in Vancouver in the 1940s, and when he retired he traveled into the smaller communities in the United States for the High Holidays, taking my mother (of blessed memory) and this little Ark containing a mini-Torah with him. Where he managed to find it, I do not know. After he died in 1969 I came into posession of it and it was a treasured relic of my father’s career. However, when we moved from a big house to a smaller one, it seemed to me that the Aron Kodesh belonged to where more people could appreciate it. The logical choice was Or Shalom. It does my heart good when the little Torah from it is carried by children so lovingly in the Simchat Torah parade. As Or Shalom endures, so will my treasured memories. The Ner Tamid that sits above the old Aron Kodesh (as of Nov. 1997) is the first driftwood lamp I have ever made. It is also the last, though I kept collecting more driftwood for years always thinking that I`d make some more. This one was picked up on Vancouver Island in 1975. In 1976 our son Noam was born, and I rushed to create a flurry of objects for his room. This was the nightlight above his crib. It was cute, but the wires always looked messy. Or Shalom (then known as Havurat Sim Shalom) was still in its early tenant phase. We had been renting space in the basement of Chalmers Church on 12th Ave – constantly setting up chairs and taking them down each Saturday, and storing our stuff in a closet down the hall. Emboldened by our growth we opted to rent a building of our own. Thus we moved into the rambling undermaintained old house on Douglas Crescent. Plaster, paint jobs and elbow grease gave us a home at last. 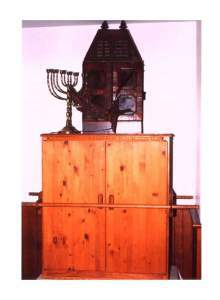 The Aron Kodesh was moved against the east wall of the large living room. As I stared at the Aron and the bare wall one Shabbat, I realized what was missing. Unknown to me, Daniel Siegel was realizing the same thing. But I beat him to it. The next day I took the clunky lamp out of Noam`s room, brought it to the davenning space, and realigned it so that the wires were hidden by the wainscotting and the concealed light glowed warmly. My driftwood was home! We’ve moved several times since then. Each time I`ve climbed a ladder, sunk eyelets into the walls, and rehung the Ner Tamid so as to explore its natural shape and conceal its technical soul. After we got a new Aron Kodesh and new Ner Tamid on Fraser St., Frank took the older elements and arranged then on the south wall. Thanks, Frank. I also have named myself “keeper of the light” – fussing over the burnt -out bulbs all these years. Now if I could find a nice spiritual purpose for all the driftwood in my basement. . . . The ark tha t houses the small Aron Kodesh contributed by Nomi Katz, and the Ner Tamid created by Avi Dolgin, was built in 1982 or 1983. It was actually the second Aron Kodesh that was made for Or Shalom, or Havurat Sim Shalom, as our community was called in those days. Daniel Siegel constructed the first one. But while his skills as a rabbi are unchallenged to this day, as a carpenter he had room for more development. (There is a temptation to make a comparison with another rabbi in history who was also a carpenter). The ark itself was constructed in a matter of days after weeks of contemplation and meditation on the internal and external structure. There were several design constraints; it had to be portable, it had to be relatively light but it also had to be able to hold several Torah scrolls. In its construction, oak plywood was used for the sides, top, bottom, and back because of its durability and 2×2 fir was used in the corners. The doors are off-the-shelf shelving. The interior is lined with aromatic cedar strips and after 15 years the aroma is still there. Celia Brauer designed and created the parochet (curtain). 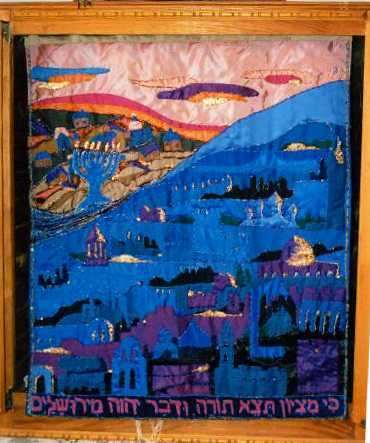 In the fall of 1985, Hanna Tiferet Siegel asked me to create a parochet to fit on the portable wooden Aron Kodesh that Frank Segal had so beautifully hand-crafted. The parochet was to honor Susan Polsky Shamash and Lisa Polsky`s mother who had passed away a few months before. There was no definite request for a theme so I set about searching for an image to build on. After rereading the passage in the Tanach which instructs the wandering Israelites to “make a curtain of blue, purple and crimson yards and finely twisted linen,” I had a vision of a twilight scene in Jerusalem where the shadows of the hills and streets were bathed in blues and purples and the gold of the setting sun was reflected off the domes and turrets of the Holy City. 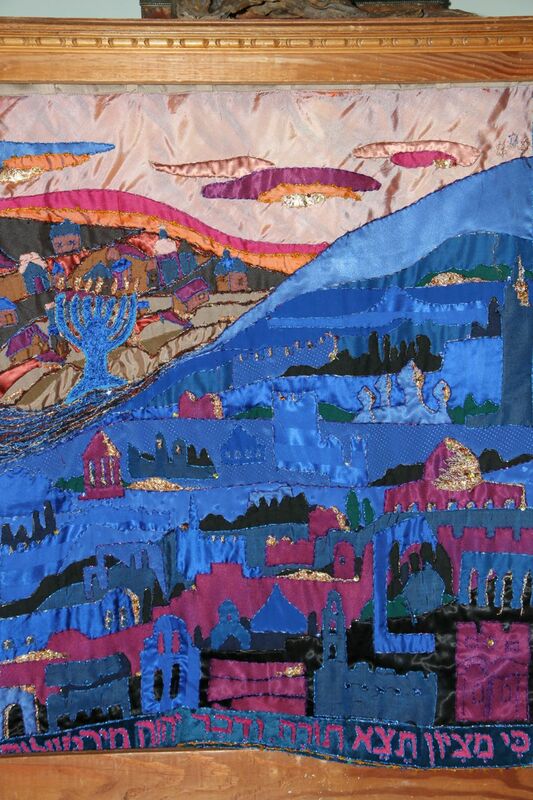 My vision was turned into reality as I collected silk and polyester fabric in many shades of blue, purple and green and fashioned them into representative images of Jerusalem`s temples, gates, trees, and walls. The layers of building one on top of the other was to call attention to the hills in and around the city. I used golden threads to highlight the tops and edges of any structure that would have caught the glint of the setting sum. Soon the whole bottom right section of the parochet was filled with images from this beautiful and very holy city. But what would be appropriate to complement this scene on the top left hand corner? 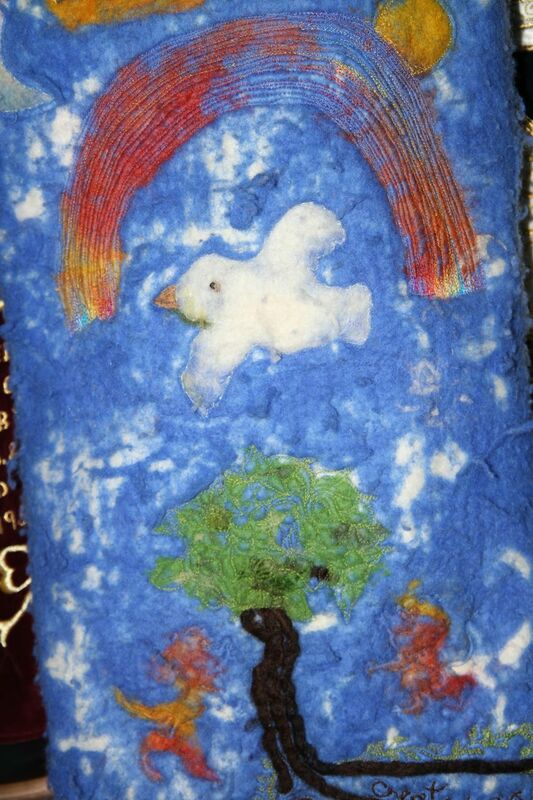 I put a river of many colored threads to divide the bottom right from the top left, and a menorah sparking its seven branches on the other side of the river. To complement the feeling of the Jews and their attachment to the holy city of Jerusalem, one has to also tell the story of the time they lived, in the Galut. For hundreds of years many Jews occupied the temperate lands of the continent north of Eretz Yisrael. For me, the rough brown earth and modest wooden homes of the shtetlach of Europe on the other side of that rich river and rich city complemented the parochet’s story. Ki Mi Zion tetze Torah, udvar Adonai mi Yerushalayim I lift up mine eyes… as they were ready to put the Torah back in the ark. Now that Or Shalom has settled down in its own shul and there is a larger more permanent Aron Kodesh, the Yerushalayim parochet sits patiently in the mobile Aron Kodesh in the northwest corner of the sanctuary. It comes out to show its colors once again for Yom Tovim such as Rosh Hashanah, Yom Kippur and Simchat Torah. The colors of the parochet have not faded and neither has the feeling of the richness of Jerusalem and our cultures. For me to see the parochet again and again is like seeing an old friend. It was my pleasure to make a parochet for Or Shalom and I am comforted that it still continues to serve the shul and honour Aarona Mary Polsky. Or Shalom’s Aron Kodesh and chandelier were installed just in time for Parshat Bereishit in 1995. Along with a new Sefer Torah, these items were donated by Morris J. and Dena Wosk, in honour of the Bar Mitzvah of their first grandson, Ariel. An aesthetics committee consisting of Reva Malkin, Sheryl Sorokin, and Hana and Moredehai Wosk determined the theme and design, and oversaw construction of the Ark. The theme of The Tree of Life was quickly identified as a common vision. Numerous sources were consulted in the process of design, including: rabbis, the Encyclopaedia Judaica, history of art books, photos and visits to many synagogues around the world. William Switzer, internationally known maker of fine furniture (and Master Aron Kodesh builder) was chosen for this challenging job. With the assistance of his outstanding staff, which includes his daughter Rene Bellas, Yulie (design) and Francisco (finishing), the project was completed in six months. The Ark was hand carved in Spain, shipped by boat, and finished in Vancouver with wood stain, gold leaf, knobs and upholstery. At the sides of the Aaron Kodesh are a carved branch and leaf motif evoking the ambiance of peace (shalom). Ten golden flowers, each placed according to the Kabalistic Tree of Life (the Ten Sephirot), come to life when sunlight washes through the window. The Ten Sephirot are there for our contemplation during services as well as for educational opportunities in classes. The doors were designed to resemble temple gates, so that the Ark would always point to something beyond itself. The Ark points to the Torah, the Torah points to our relationship with God, ultimately to infuse our lives and world with holiness. 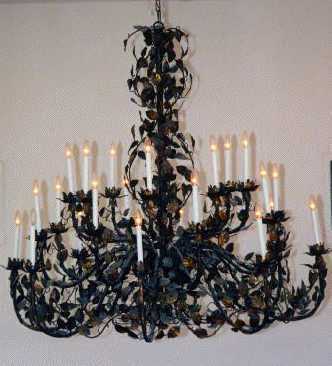 The iron chandelier was hand-cast in Florence, Italy. It was glazed with green brown and reds. Subtle splashes of gold leaf help to create the sense of sunlight reflecting through the branches of the Tree of Life. The interpretations of these symbols are not limited to the above. They are open to ongoing associations and reflective contemplations. If you walk into the Or Shalom shul at 10th and Fraser today, you will find a homey, but very respectable synagogue. There are proper pews to sit on (although a few die-hards still insist on sitting on the floor). An elegant chandelier lights up the carefully refined interior and the Torahs are housed in large and beautifully crafted ark. But what is this, hanging from knobs at the front of the ark? 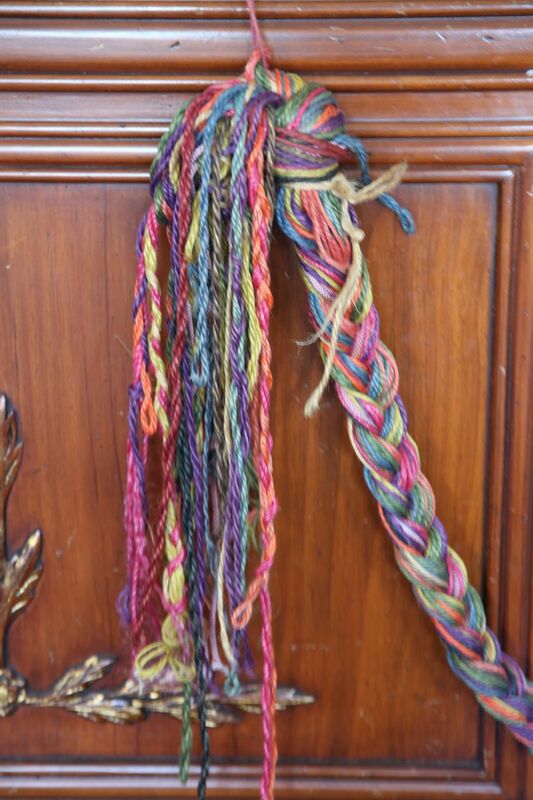 You might think that the loosely braided, not quite balanced, multi colored cord is something that the children left there by mistake. This cord is not from Or Shalom`s children. It is from Or Shalom’s parents, Rabbi Daniel and Hanna-Tiferet Siegel. They were the ones who first gathered the souls, opened the gates of prayer and started the music that brought Or Shalom into existence and turned it into a congregation. Children grow up, parents move on, and the generations go their separate ways. But how do you say good-bye? It was Hanna, a mother, who realized that we had to cut the umbilical cord, both figuratively and literally. So, with Hanna and Daniel at one end of a bouquet of colored cords and the Or Shalom members at the other, we danced around each other weaving the cords into one long, firm braid that united the founding rabbis with their growing minyan. And then we cut the cord. Daniel and Hanna took their half, a little piece of Or Shalom, with them as they moved on. And, to this day, Or Shalom keeps a slightly tattered braid in its ark, so that we will never forget how two good people, many years ago, gathered together a minyan and formed a new house in Israel. This story starts with my father, Benjamin Morton (Mordechai), son of Aaron and Pauline (Pesha). His whole life he had been an observant, conservative Jew, actively involved in Jewish politics and ideas at the local synagogue level and on a wider scale, particularly in relation to Israel. He was a scientist, but he filtered all of his thoughts and opinions through his awareness of himself as a Jew. He was diligent and persistent in demanding my involvement with Judaism when I was a child. As an adult, nothing I did pleased him more than seeing me pass Judaism on my daughters. This was because he considered the Jewish tradition he had received, starting with the Torah, as his most precious possession. He defined himself through it and it gave his life meaning. Until I met Rabbi Daniel Siegel, in the early 80’s, I had not found the same nourishment in the Jewish tradition. Through him, and carrying on in the Or Shalom of the mid-Eighties, it gave me great pleasure to be able to share this exploration with my father. I knew that Or Shalom depended on a borrowed second Torah. It seemed to me that the gift of a Torah to Or Shalom would be the perfect way to honor his memory after he died in March of 1990. I made some inquiries, and discovered that a reconditioned Torah cost about $10,000. I asked my mother if she would like to go in with me on this gift, and that made it possible to consider it. While a Rabbi who had been a friend of my father was keeping his eye open for a good, reconditioned Torah, fate intervened. Or Shalom received an offer of a free Torah from a defunct congregation in Portage-le-Prairie. I was happy to shift the money I had been meaning to contribute to the purchase of the used Torah to cover the expenses involved in bringing this gift to Or Shalom. This seemed particularly appropriate as my father was born and raised in a Jewish community in Superior, Wisconsin, only a few hundred miles from Portage-le-Prairie. He probably attended a congregation much like the one this Torah had been in. In January of 1991 I flew to Winnipeg one Friday morning. I rented a car and drove out to meet Mr. Greenberg, the elderly lawyer in Portage-le-Prairie who was keeping the religious objects from the now defunct congregation in his house there. Mr. Greenberg still worked part time in the law firm in Portage-le-Prairie that was now run by his nephews. They, along with the rest of the Jewish community, had moved to Winnipeg when good roads had made the commute so easy. Mr. Greenberg lived alone in a house that looked like it hadn’t received a penny devoted to redecoration in at least 30 years. Across the faded rug on the worn floor boards was a ratty, 75 year old side board with two Torahs lying on it. Mr. Greenberg showed me the smaller Torah. We opened it. The lettering was beautiful, though faded in places to an attractive reddish-brown. As we chatted I told him about Or Shalom and what a special place it was. Mr. Greenberg seemed to be impressed. I asked him about the other Torah. He seemed worried about his responsibility for these religious objects. He did not want to waste them on a congregation that was self aggrandizing. I assured him that they would be used with gratitude and respect at Or Shalom, and asked him if he had any other objects looking for a home. He opened a cupboard and took out a shofar and a Megillah Esther scroll from Odesssa in a metal case. I was happy to receive them and asked him again about the other Torah. He said that there were some problems about giving that one away at that time. I thanked him for his generosity, wrapped the smaller Torah in my father’s tallit, and hastened to drive back to Winnipeg before dark. The Torah was not to travel on Shabbat. When I returned to Vancouver on Sunday, I brought the Torah to the Bayit on 28th Ave. Rabbi Marmorstein had arranged for a Rabbi from Congregation Beth Hamidrash to inspect the Torah. We had the Torah open on the table when he arrived. From the door he pronounced it unkosher. The letters cannot have been allowed to fade. A kosher Torah must have black letters. It would have had to have been restored by a scribe. Rabbi Marmorstein thought we might be able to save the $5000-8000 that would cost by having the congregation take on the task as an arts and crafts project (after suitable, scribal instruction, of course). We were told that the lovely little Torah would be acceptable only for training purposes. I called Mr. Greenberg and asked him once more about the other Torah whose letters were solid black. Mr. Greenberg told me he would have to check on something to find out if that Torah was available and said he would get back to me in a few weeks. After a month I gave him another call. He apologized for the delay, and said it had turned out to be more complicated than he thought it would be. When I asked him when he might know, he hesitated. Finally he announced that he had made a decision. He would let us have the Torah on the understanding that we would give it back to him in the unlikely possibility that he should ask for it. I checked with Rabbi Marmorstein, and we agreed to accept the Torah under those conditions. A few weeks later, Sharon Marmorstein’s parents happened to be coming from Winnipeg for a visit, and they brought the Torah with them. On Shavuot, much to my surprise, Reb Zalman conducted a ceremony at the Or Shalom retreat in which the Torah was welcomed into our community in honor of my father’s memory. 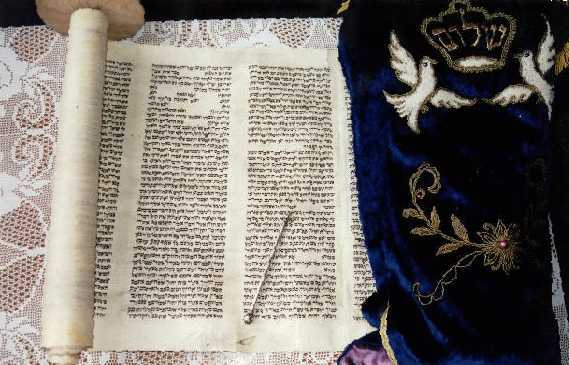 As I understand it, the small Torah with the faded letters has been given (lent??) to a gay and lesbian congregation in Seattle. It is nice to think that it has a home where it will be respected and appreciated. Mr. Greenberg never explained exactly what the problem was in giving us the second Torah, but from things he said I think I understand. I believe that the Torah actually belonged to a member of the congregation in Portage-le-Prairie, rather than to the congregation itself. I believe that the owner had died, and all of his family had moved away from Winnipeg. Either they didn’t know about the Torah, or they didn’t care. Mr. Greenberg had wanted to check with those heirs before giving us the Torah, but he was having difficulty finding them. He decided to take the responsibility of letting us have the Torah so it would be used. At the same time, he wanted to be sure that he could return it, in the unlikely possibility that one of those heirs should come and ask him for it. This seemed a morally reasonable course of action to me. Since Mr. Greenberg was a lawyer, I also assumed that he would not be doing something that was not legally defensible. So, that is the story of the Or Shalom Torahs that honor the spirit of my father, Benjamin Morton (Mordechai), son of Aaron and Pauline (Pesha). Before Or Shalom purchased the property at 10th and Fraser, it had long been a Scottish Presbyterian Church. Once the focus point of an active community, the church succumbed to the changing demographics of the neighbourhood, and was put up for sale in 1993. We purchased an old structure, with inadequate wiring, no modern safety features, no hot water, etc. But as we went through the treasures that our new home contained, we found Presbyterian hymnals, lots of teacups and half-used jars of marmelade, and this painting. On the back is the title ‘The Highland Church”, plus the signature of the artist, Mrs. Myrtle Thomson. 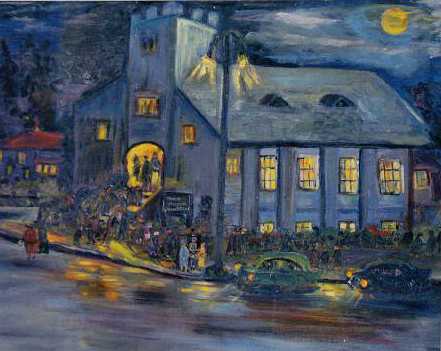 Her painting reflects the vibrancy of this building in community life one night in Vancouver some 50 or so years ago. We honour the memory of that Community of Faith which preceded us here, and carry on in their path. Ner Tamid, Glasswork, Fabric Art, Photos and Graphics, Torah Ornaments, Bookshelves, Trees, etc.,etc. There are a lot of stories to tell! More content authored and edited by the Webbe Rebbe, Avi Dolgin. And bring the works of our hands to reflect your presence in us. The Creator is certainly with us, and our own creations speak of that presence. Look about you at Or Shalom and see the divine handiwork in wood, in cloth, in plants, in glass, in computer graphics, etc. Many of the stories of these objects have been told elsewhere on this site by their donors or creators. But there are many more objects and stories, and I guess it’s up to me (Avi Dolgin) to tell you what I know (or think I know) about them. As always, I invite your additions or corrections – contact me with your information. The Ner Tamid (Eternal Light) comes from Issaac Thau. As a kid he sat in his father’s shop and repaired broken lamps for his allowance. As an adult he directed the repair and rennovation of this building. 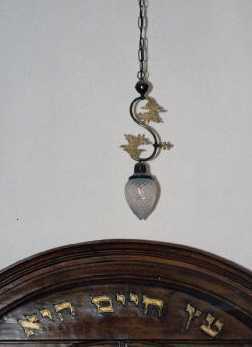 After the installation of the new Aron Kodesh and the chandelier, he searched the junk shops of the city looking for a lamp to match the tree & leaf motif. Then he…. 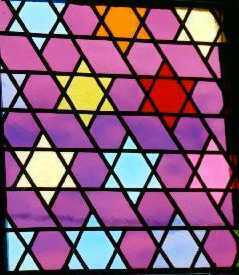 The Magen David coloured glass in the window is the gift of David Mullard. 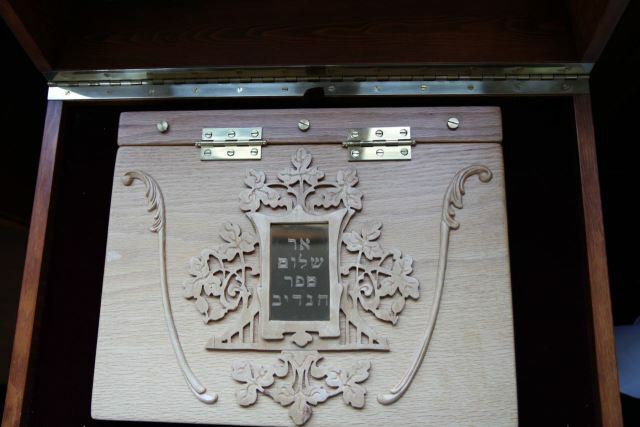 It was made by his brother in England, and then placed there “temporarily” for the bat mitzvah of Yael Mullard. Who would take it down? 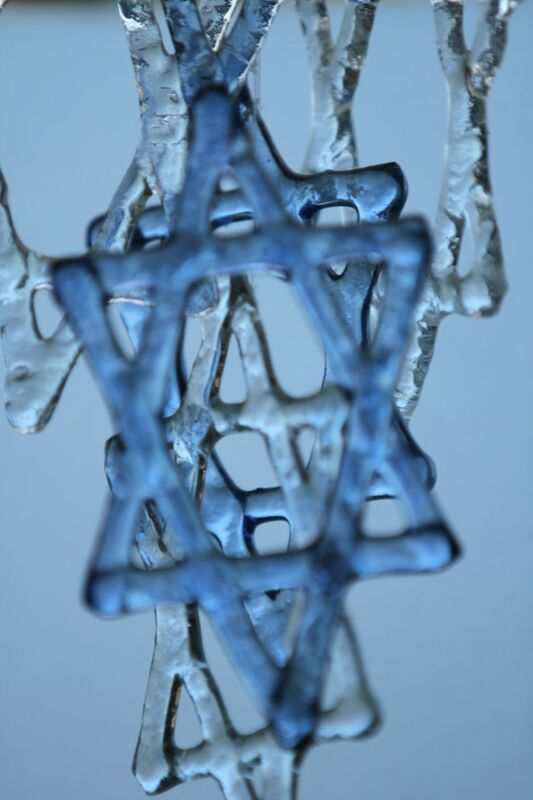 The Magen David glass mobile is the gift of Marianne Rev and Tom Ross. The fabric art Torah cover was made by the Bnei mitzvah class, under the artistic direction of Claudia Azoulai and Lorraine Fralin.The fabric art piece on the eastern wall was made by our Or Shalom school children under the creative direction of Claudie Azoulai. “Haida Hamsa” is the name of the large graphic on the door of the sanctuary. It was made by Michael Corber, and reflects Michael’s computer skills, Jewish interests, and time spent working for Native peoples of BC. For Michael’s birthday party at the shul we decorated in the many creations he has blessed us with. After the party he packed away his accordion and we took down all the artwork – except this piece. The photo on the northern wall is of the Women of the Wall davvening for Rosh Hodesh in Yerushalayim. It was taken by Naomi Ehren-Lis in 1999, purchased for Or Shalom by Myrna Rabinowitz and framed by David Mivasair. 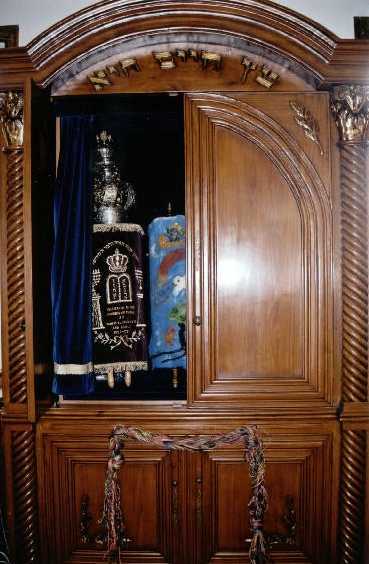 The jewelry piece hanging inside the door of the portable ark was the gift of Hanna Chusid. Hanna was an active member in our earlier years who has since moved to California. The piece was a necklace of her late mother’s, which Hanna gave to us as our first Torah decoration. We outta use it that way sometimes. 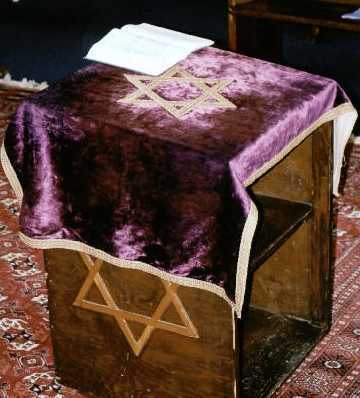 The purple velvet shtender cover with the Magen David on it was found by Reb David. It was stuffed unceremoniously in a cardboard carton behind the bimah in the shul in State College, PA where he served as rabbi from 1991-95. No one wanted it and, with congregation’s permission, he gladly acquired it for future use in a shul that would appreciate it. The bookshelf on the mezzanine level is the gift of Reva Malkin, in honour of her late father Dr. Sol Malkin, whose warm smile and curious mind will long be remembered by many of us. 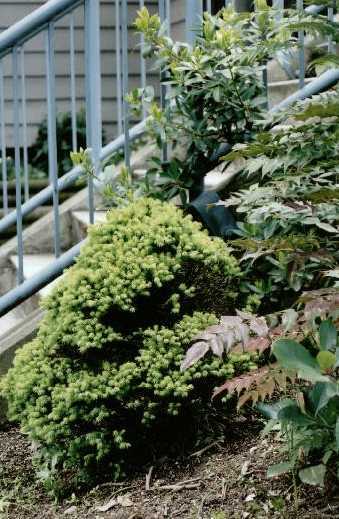 In front of the building, up close to the concrete steps, are two small pine trees. They came from the yard of Sabie Freedman. Sabie was an elderly woman who lived accross the street from our rented premesis on W. 28th Ave. She loved to come for services, on the arm of “that nice young man” (who was usually Len Ryant, though several of us did this mitzvah, and Sabie couldn’t tell us apart). These trees had been planted by her son, Wayne. Just before Sabie moved to the Louis Brier Home and her house was sold, she told me she wanted these trees to go to Or Shalom. I dug them up, tended them in my backyard for two years, and transplanted them to our new site when I could. Sabie and Wayne are both gone now – these trees are their memorial.